On Sept 4, 1958, the Declaration of the Government of the People's Republic of China said that the breadth of the territorial sea of the country shall be 12 nautical miles and that this provision should apply to all territories of the PRC, including all the islands in the South China Sea. 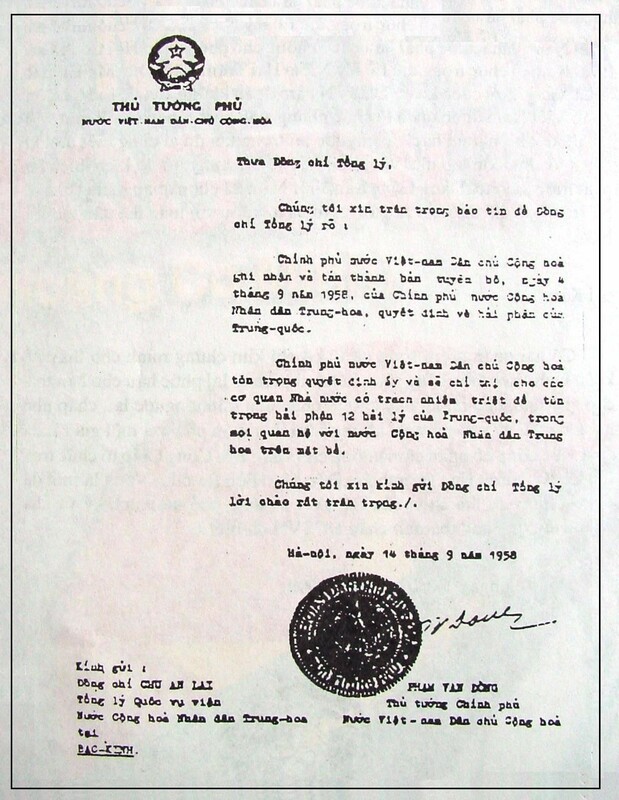 On Sept 14, 1958, Pham Van Dong solemnly stated in his note to Zhou Enlai that Vietnam recognizes and supports the Declaration of the Government of the PRC on the country's territorial sea. On Sept 22, 1958, the diplomatic note was publicly published in Nhan Dan, the official newspaper of the Vietnamese Communist Party. "the Vietnamese government approves of of the declaration ... and will give all state organs concerted directives aimed at ensuring strict respect of Chinese territorial water fixed at 12 nautical miles in all relations with China at Sea."